The Tool Presets toolbar lets you create new tool presets and manage existing ones. 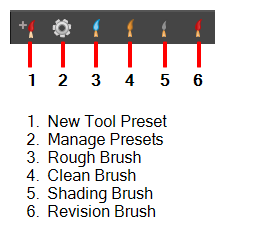 There are also four default brush presets available. For tasks related to this toolbar, see Creating Tool Presets and Updating Tool Presets. Select Windows > Toolbars > Tool Presets. Opens the New Tool Preset dialog box in which you can create a custom tool preset and add it to the Tool Presets toolbar for quick access. Opens the Manage Tool Presets dialog box in which you can update and delete existing tool presets, and import and export tool presets. A blue brush for quickly creating rough drawings. A black brush for creating the clean lines in a drawing. A brush that is set for shading. Any strokes that you draw will appear behind objects. A red brush for making revisions to a drawing. When you activate this brush, a revision layer is created for the current panel.